Hold on to your hats, I have decided to go public with many of my brilliant ideas that could someone rich. We all have them, but keep them to ourselves as if one day when we get the time (yeah right) and the money (yeah righter) then we will invent that hydro-car, open that chartreuse organic vodka bar, or solve world hunger with the cunning use of hologram bees, and strike fame and fortune doing it. You know how it goes, "Someone should invent such and such, then we would never have to trip over our shoe laces again!" You might have even gone so far as to research your brilliant idea online, thinking up lots of catchy url's that are already taken by some obscure literary group or web squatters, before letting it settle into a folder on your hard drive, waiting patiently for resurrection when the "right time" comes. Being honest with myself, I'm probably not going to execute most of my brilliant ideas. Many of them, in fact, I don't even want to, I just want someone else to do it so I can take advantage of whatever it is. Oh yeah, and I'd like to brand it, please! So please, Mr. or Ms. Investor/Entrepreneur, I'll be your Creative Director if you get the idea going into a business. The idea is free! Just hire Little Black Mask Marketing to bring out your inner super-hero image! I believe the nacho is highly underutilized. We are totally missing the breadth of the nacho's potential by limiting them to the Americanized-Mexican toppings. I propose a restaurant with an international menu comprised entirely of nachos. Think of just the nacho chip itself. It can be made from corn, flour, wheat, it could be herbed, cheesed, spiced. Now combine those with an endless selection of toppings. Filet mignon tidbits, julienne roasted veggies, salad, crumbled meatloaf, shredded buffalo chicken or shrimp, spinach and ricotta, roasted garlic and brie, the options are infinite. Breakfast? Eggs Benedict Nacho. Dessert? It's Nacho Tiramisu, Cinnamon nachos drizzled with I don't know what because I'm not a Chef, but I imagine this could go on and on given that the nacho is a sturdy and versatile vehicle you can enjoy with our without flatware. It's Nacho Restaurant offers sampling orders (three nachos) up to heaping party plates, and boasts a drink menu with equally endless choices to match with your nacho selections. There are some of us on whom the innocent perspective of the mainstream consumer is long lost. When a Chef is out to eat, he won't see or taste food in the same way the average diner does. We in advertising don't see anything commercial through mainstream eyes either. We analyze what goes into things; the design, who paid for it, who might have created it, what font they used, how much money the photography cost, whether the production was in or out of town, and on and on. It might not all be conscious, but that's what we're thinking. This makes life a little less magical, if a little more interesting, depending on one's point of view. What at first seems like a simple, scenic drive on the Florida Turnpike can turn into a veritable ad buffet. Billboards, trucking companies, vehicle wraps, license plates, toll metrics, road signs, it goes on and on. Opportunities are everywhere for the innovative advertiser to get in front of the unassuming consumer. Take the "your logo here" on the Adopt-a-Highway sign. 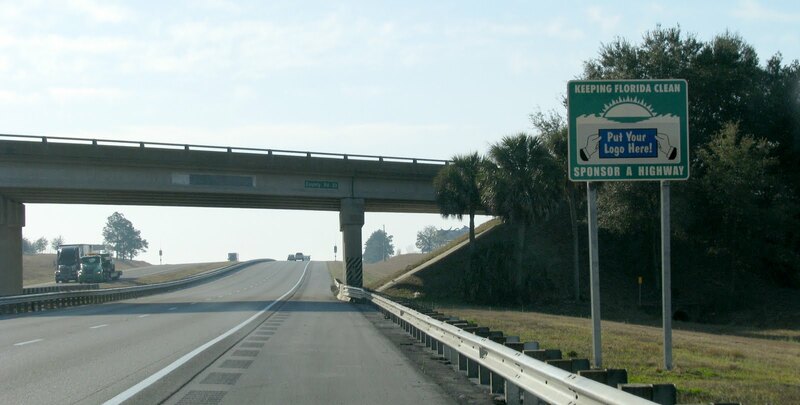 Put your logo on a sign and agree to keep a 2-mile stretch of highway clean. Pick your stretch of Turnpike, even. "I'll take the really busy one by Orlando, please!" Passers-by will associate your company with being environmentally responsible, and more importantly, they will see, read, think your name every time they drive by it. It gets better. State Farm Insurance, in partnership with the FL Turnpike (and several U.S. highway authorities) operates a service providing free roadside assistance. Signs are everywhere letting you know. 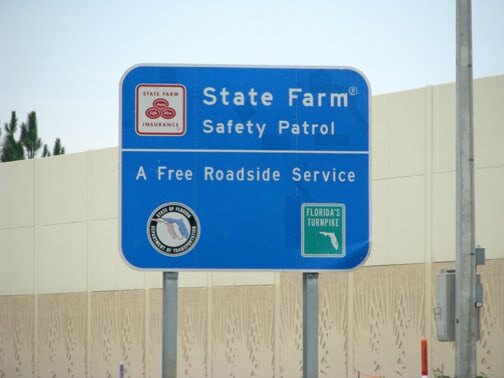 "Wow," a driver might think, "State Farm gives free roadside assistance! They are a caring and responsible company who is involved with our government. How trustworthy and official they must be." It might not be conscious, but that's what they're thinking. What this really is, is smart advertising. It's sponsorship. According to Wikipedia, the free roadside assistance only covers stranded motorists on participating highways, if they call the designated telephone number (umm, that's not on the sign) and they respond to the following services: fuel refills, radiator refills, engine oil refills. What about flat tires? Engine trouble? Accidents? It probably doesn't matter because no one knows the number to call. State Farm gets a good deal out of this. They get a gagillion impressions per day and their expense is minimal, comparatively. So next time you're driving or walking around, keep your eye out for the opportunity that isn't already taken. Where can you do some good publicly to raise your visibility, your reputation and your humanity-brownie-points? Blog as I say, not as I do. It's easy to to teach, preach, explain and blog about best practices. But just like the cobbler whose children have no shoes, often the blogger and social marketer isn't being very consistent with their own content. I've been busy, busy enough that somehow blogging has gone undone for ... omg! Seven weeks? Can it be? How embarrassing. Good people, do not do try this at home. Do not wait seven weeks to pick up a barely-weekly blog again. It's just not done. You'll lose readers' interest, they expect consistency. 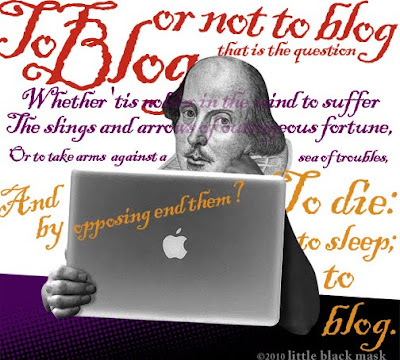 Keep their trust, blog onward, blog faithfully. I know this very well, yet I slipped. I have failed to do as I say. Getting back on track, I will employ a method that I preach. For consistent blogging, rain or shine, one word: stockpile. Constantly make notes and compile topics. When you think of something new to blog about, write down as much of it as possible as soon as you get a chance. Where ever you are, send yourself a note on your phone, or keep a notebook within reach at all times. On those weeks when you're short on time or when current news is not worth commenting on, draw from your arsenal. Have blogs ready to post within minutes. Review and update to make sure they are current, and post. Clickitty-split. Blog to you next week, over and out!